Planned farm steading with 4 ranges of buildings laid out around a central square courtyard, the steading is remarkable for the presence of an almost complete horse-powered threshing machine. 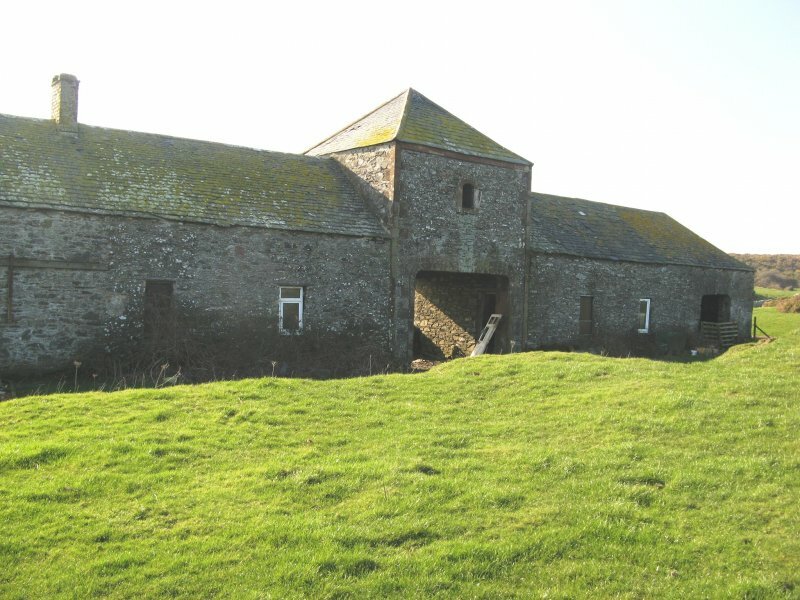 STEADING: single storey and loft buildings, rubble walling with polished red sandstone margins and quoins to main E front. 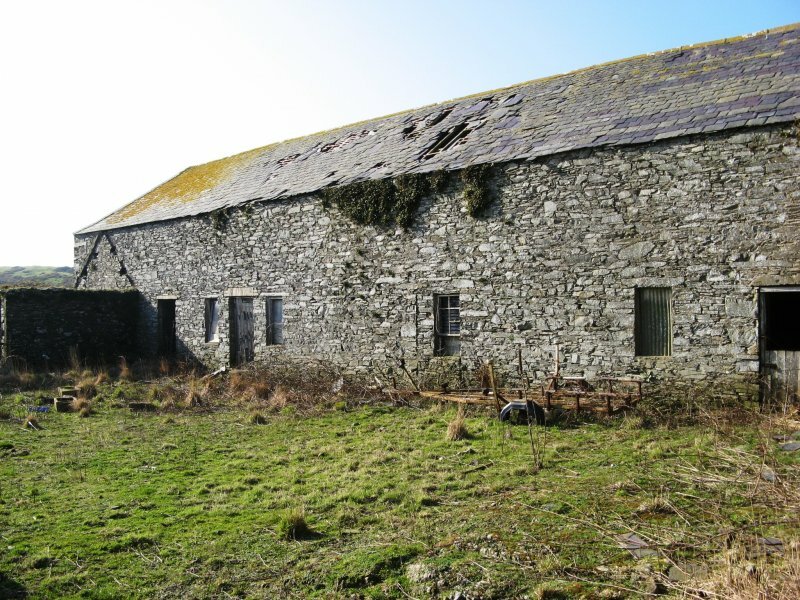 Ranges to S and W roofless and walls becoming derelict. Circular horse engine house to NE adjoining threshing barn. E RANGE: symmetrical 7-bay show front. Taller advanced centre bay has near flat-arch pend to ground with red sandstone voussoirs. Above this a pyramid roofed dovecot with round-arched opening to E. The outer bays have rubble voussoired, depressed-arch cart entrances, 2 windows to inner bays, sash and case with 12-pane glazing. 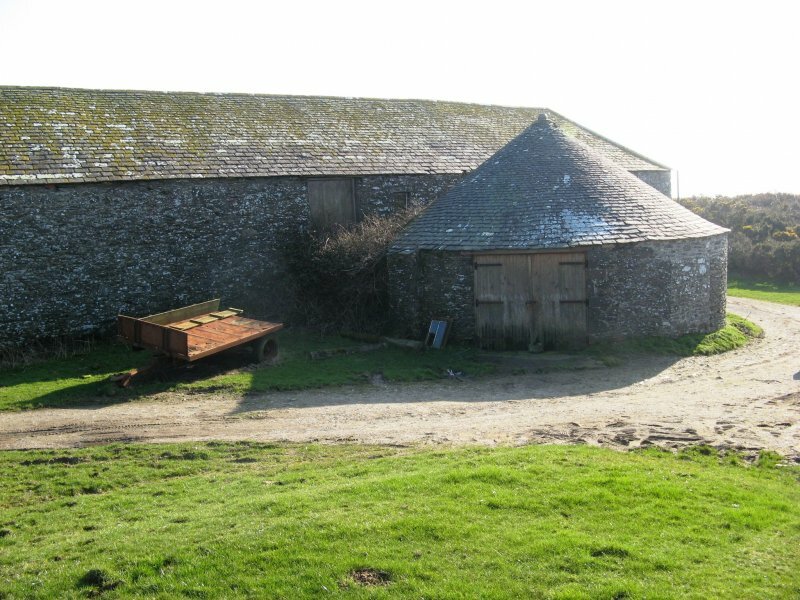 2 door lead from pend to stables, that to right for working horses, that to left with 3 stalls for carriage horses, a curved and shaped timber-lined roof and hay chute trapdoor. Next to the carriage horse stable is a harness room with small fireplace. Hay loft runs whole length of E range. 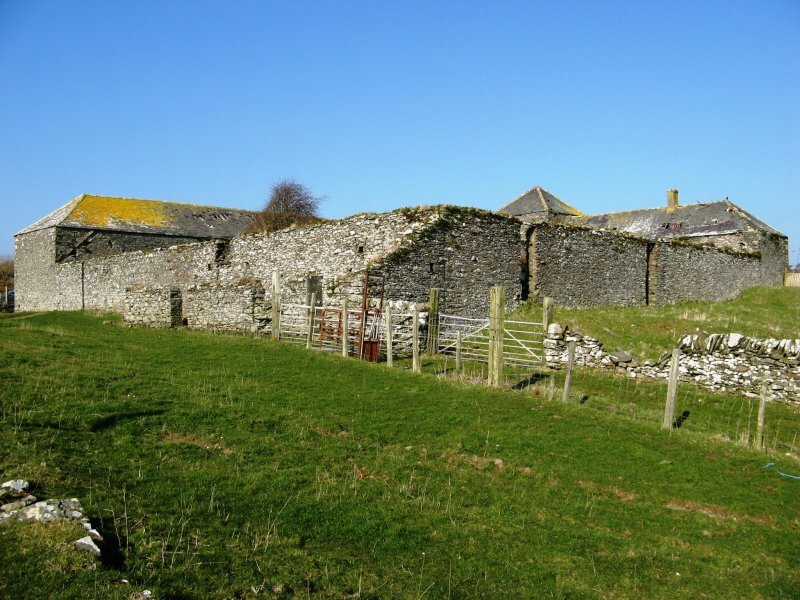 N RANGE: most of this range is occupied by the taller 2-storey threshing barn with straw house to W. The E portion of the range has a small byre or store. Projecting from the N face of this range is a circular horse engine house, rubble-built and with most of its original openings blocked in rubble. Conical slate roofs. Internally the upright shaft with harness shafts have been removed but the gear train and drive shaft are in place. The drive shaft connects to a virtually complete roller feed threshing machine, only the fanner unit is missing. The straw house is located to the W and the ground floor access from it to the threshing barn has been recently (1988) blocked in breeze block. S AND W RANGES: formerly byres, probably loose byres. Roofless but mainly complete to wallhead. Single storey, depressed-arch openings, that to W range was originally another pend, blocked by 1894. Footings of a drystone dyke enclosing the S part of the courtyard (presumably as a cattle court) can be seen. 12 March 2014: External inspection finds the complex overall in poor condition with roofs that are deteriorating rapidly or are missing entirely. The steading appears to be disused and heavy weed growths have established themselves within the courtyard. Timber elements are decayed, blocked up or missing.